After graduating with her Doctorate in 1989, Dr. Ahmed is proud to celebrate 25 years practicing optometry at the same location in Mississauga. She went on to complete Therapeutic Pharmaceutical Certification in California and Dr. Ahmed has trained in the latest advances in eye care, bringing a new level of vision care and eye health service to the Greater Toronto Area. Dr. Ahmed has always been an active member in profession and community. 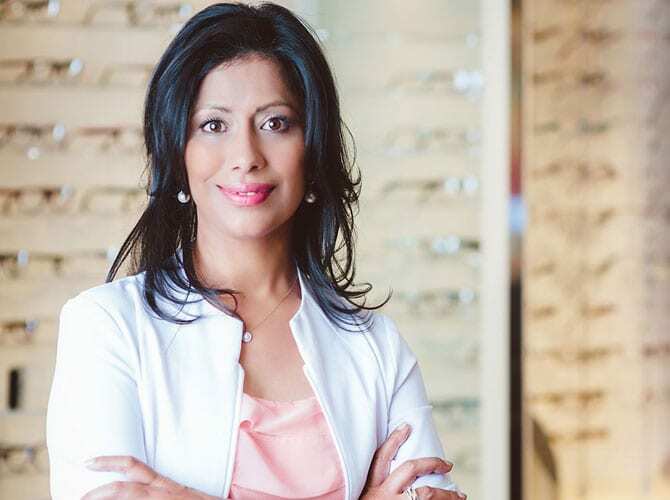 She is a member of the Ontario Association of Optometrists and Canadian Association of Optometrists, and is a keen member of the Mississauga Optometric Community. She is also a member of the College of Optometrists of Ontario. She has a close working relationship with several Mississauga and Toronto Ophthalmologists as well as numerous Family Physicians. Dr. Ahmed continues to have a strong interest in Laser Surgery and fully trained in laser co-management in 1999. She has close affiliations with Herzig Eye Institute, Bochner Eye Institute and TLC, the top laser centers in Toronto. She feels so strongly about laser surgery as a viable option to both specs and contacts that she had the surgery in 1999. Dr. Ahmed continues to have a strong interest in contact lenses and has performed in-office clinical evaluations for many Canadian and American contact lens manufacturers. She is first and foremost, a warm and caring optometrist in Meadowvale & Mississauga who is driven by the desire to find the best way to correct vision and eye problems for her patients. She personally oversees and is involved in all aspects of a patient?s service at her clinic. Her hobbies outside of eye care include promoting wellness health care. Dr. Ahmed is married with one child, and lives in Mississauga.